Dark and mysterious. These sultry 9ct white gold earrings feature a shiny black coloured pearl, delicately wrapped in a strand of white gold. 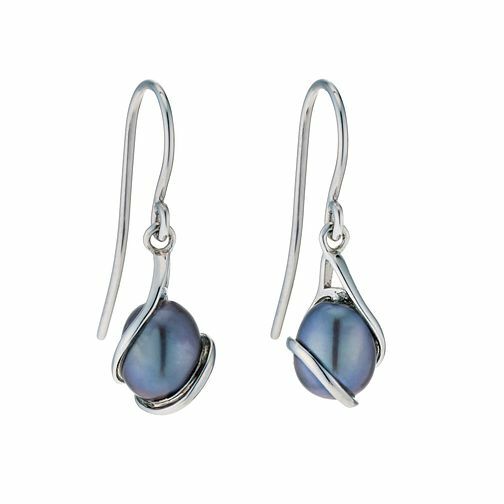 A perfect finish to an evening look, these earrings will make a lovely gift. 9ct White Gold black coloured Pearl Earrings is rated 4.9 out of 5 by 7. Rated 5 out of 5 by Anonymous from Excellent and beautiful product. Beautiful and decent product. Not too big for ears and very classy. Would definitely buy another one for somebody else. Rated 5 out of 5 by Anonymous from My wife loves them I bought these as a Christmas present for my wife and she loves them.